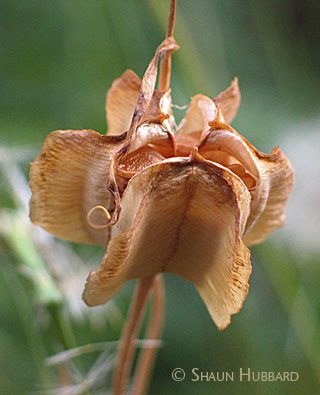 also called Rice-root Lily, Checker Lily, Mission Bells, or Northwestern Fritillary. Tepals 6, ½–1⅓” long [2–3 cm], inward-curving, brownish purple mottled with yellowish green; 6 stamens; flowers pendent, 1–4; seed capsule (lower photo) ½” long [2 cm], 6-winged, held more erect; leaves 2–5″ long [5–13 cm], ⅛–1″ wide [3–25 mm], some in whorls and some single; stem 5–36″ tall [13–90 cm], from a bulb of a few large garliclike cloves with many tiny ricelike bulblets. Habitat: Grassy slopes below treeline; WA, w OR, n ID, sw and sc BC. 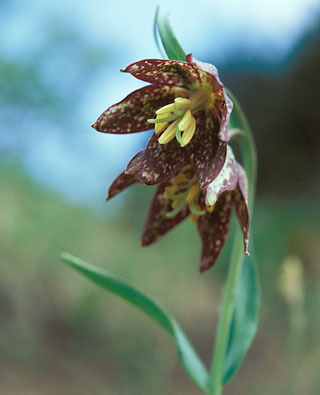 Both this genus of lilies and a type of butterflies may have more or less checkered color patterns on their petals or their wings, respectively, and are called fritillaries, after a Latin word for a chess board. The Romans had a sort of dice box they called a fritillus, and the flower’s name has sometimes been traced to that word, but the chess board explanation makes more sense and is found in Gerard’s Herball of 1597.